Pinhole photography, at its heart, combines the most low-tech materials with the highest ideals of art. Nowhere can that be better seen than in Ben Conrad’s pinhole suit. Lately, the only place to see it has been the Conservation Lab behind the museum’s administrative offices. There, Casey Mallinckrodt, an intern for the Conservation Department of the Museum of New Mexico, has painstakingly repaired cameras that consist of little more than cardboard, duct tape, electrician’s tape and glue. 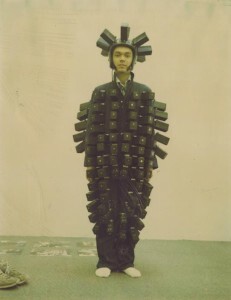 In 1994, Conrad used Velcro to affix 125 of the rickety cameras to a pair of Big Ben coveralls and a motorcycle helmet. Working with assistants in a darkroom, he loaded the cameras with film. His helpers covered him with a tarp and ferried him outside, where they lifted the tarp to expose the film. Quickly covering him again, they returned to the darkroom to develop the multi-eyed vision of his surroundings. Caroline Lajoie, designer of the exhibition, Poetics of Light: Pinhole Photography, opening April 27, has devised a way to display the suit on a mannequin surrounded by the images it took. 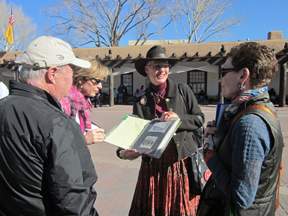 Upon learning of that Frances Levine, director of the New Mexico History Museum/Palace of the Governors will soon take over leadership of the Missouri History Museum in St. Louis, many of our supporters asked what she might want for a going-away present. The answer? Nothing. At least nothing for herself. In a selfless display of generosity, Fran is asking folks who want to honor her years of accomplishment to instead consider donating money to the Museum of New Mexico Foundation’s Acquisitions Fund. 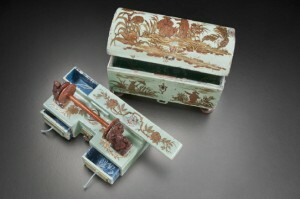 The item we’re dying to buy is this sewing box, a rare example of an 18th-century delicacy from Michoacán, Mexico, still bearing its original, hand-lacquered finish in the Chinoiserie style. As for what else makes it so special, read Fran’s description of it, along with details about how you can help her leave an even longer-lasting legacy. 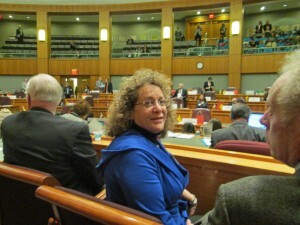 Wednesday, February 19, 2014, found New Mexico History Museum Director Frances Levine on the floor of the state Senate, for all the right reasons. Given a seat of honor on the rostrum, she heard the reading of a certificate honoring her service to the state and wishing her well on her next adventure as president and chief executive officer of the Missouri History Museum in St. Louis. The Historical Downtown Walking Tours led by museum-trained guides have grown into a popular pastime among locals and tourists alike. This year’s tours will run from April 14 through Oct. 11. To boost the ranks of volunteer guides, the New Mexico History Museum and Los Compadres del Palacio, a support group of the Museum of New Mexico Foundation, are inaugurating a special recruitment and training opportunity. You could be just the person we’re looking for. Do you possess a deep love of Santa Fe and knowledge of New Mexico history? Enjoy spending time outdoors and meeting people from all over the world? This could be your perfect niche.